Following paragraph format can help you organize your answer for a short response on a standardized test. 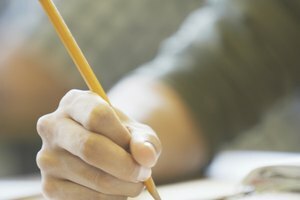 Chances are if you're taking a standardized test, you're going to be required to write a short response in addition to answering multiple-choice questions. Short-response questions are designed to gauge your knowledge of a particular topic. These questions generally follow the compare and contrast or the give an example formats. Keep your short response paragraph-length and follow the basic paragraph format -- topic sentence, supporting sentences and concluding sentence -- to help organize your answer. Read the instructions and the short-answer question at least twice before you begin to write. Doing so will help ensure that you understand the instructions, and that you know what you're being asked to answer. Take notice of whether the short response consists of more than one component to which you're being asked to respond. Jot down your immediate thoughts about the answer on scratch paper if it's provided to you. This will serve as a quick outline. Outlining your answer will help to present your thoughts as organized and will lessen the chances that you'll ramble. If you aren't provided with scratch paper, write your quick outline in the margins of your test paper. Remember to erase your outline before submitting your test. Prepare to write a paragraph that is between five and ten sentences in length. Write your topic sentence. The topic sentence states the main idea of your paragraph, alerting readers what your paragraph will be about. For example, a topic sentence for a short response could read: "There are numerous ways to recycle to help prevent the widespread use of landfills." Add several supporting sentences. These act as evidence for your topic sentence and help to develop the main idea of the paragraph. Write these to include examples, facts or details. Following the example topic sentence in the previous step, a supporting sentence could read: "Starting a recycling program at your school to collect the scores of sheets of paper thrown away each day could keep this material out of landfills." End your paragraph by writing a concluding sentence. In this sentence, restate the main idea of your paragraph. Do not introduce new information. The purpose of the concluding sentence is to reiterate your point. Reread your paragraph and check it against the question you were asked to answer. If a rubric is provided for you, make sure you address all of its components. Double check your response for correct spelling and grammar usage as well. Nicholas, Melissa. 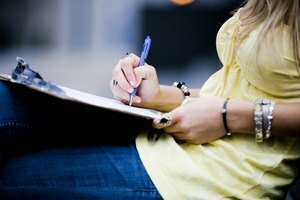 "How Do I Write a Short Response on a Standardized Test?" Synonym, https://classroom.synonym.com/write-short-response-standardized-test-22239.html. 26 September 2017.